A covered hopper is any railroad car with a full roof and unloading bays, or hoppers, on the bottom of the car. Typically these cars are used for bulk shipment of granular loads. Agricultural products, plastics, salt, dry chemicals and cement are all common loads. Today, covered hoppers are one of the most common freight cars on the rails. But they are also one of the youngest common types. Despite the widespread use of open-top hoppers for coal and mineral service beginning in the 1880s and 1890s, covered hoppers were extremely rare until the 1930s. The larger cars we see most commonly today didn't arrive until the 1960s. Prior to this time, loads like grains and cement were shipped in boxcars in bags or bulk. For bulk shipments, boxcars had roof-top loading hatches and special doors. Although unloading was much more time consuming, this freed the car for service with other loads - such as during off-peak grain seasons. Covered hoppers come in many shapes and sizes. Heavier and more dense loads typically ride in smaller cars. Cement service cars for example are typically around 30 feet long, whereas plastic pellets usually travel in 64 foot cars. If your model railroad is set anytime from the 1930s to today, you'll want at least some of these distinctive cars on your layout. Here are some product reviews, modeling tips and prototype photos to help you choose the right cars for your layout, make them accurate and put them in the right roles for your operating sessions. The lettering on both cars purchased was crisp and solid. ©2013 Ryan C Kunkle, licensed to About.com, Inc. The Pennsylvania's H30 was one of the first common covered hopper designs. Although unique to the Pennsy, these cars could be found nationwide. In service from the 1930s to the 1960s, several cars remain as stationary sand storage buildings or preserved in museums. The distinctive external truss supports make these cars easy to spot and a must have for steam and diesel era modelers. Tangent's PS4750 features amazing detail, beautiful deco and reliable operation. ©2015 Ryan C Kunkle, licensed to About.com, Inc. The Pullman Standard PS-4750 is one of the most common covered hoppers of all time. Thousands were built in the 1970s for hauling a variety of loads - mostly agricultural. Many of these cars featured bright "billboard" color schemes in the 1970s. Hundreds are still in service in the 2010s. This is also one of the most frequently modeled covered hoppers, with several versions available in most of the popular scales. Here are reviews of two excellent models in HO: Accurail's PS-4750 is a simple and inexpensive yet well detailed kit - perfect for those who enjoy a light project and customizing. Tangent's PS-4750 is a highly detailed replica with many prototype variations represented accurately - a great value for those who demand the highest level of detail. Tangent has captured the unique look of the Dry-Flo hopper in HO Scale. The Conrail models represent former Pennsylvania Railroad cars. ©2014 Ryan C Kunkle, licensed to About.com, Inc.
A predecessor to the pressurized cars seen commonly today, the Dry-Flow used forced air to help break up the load and force it out the bottom of the car. This made unloading faster and more complete. Since the air was provided by a compressor at the unloading site, the added equipment added very little to the overall weight of the car. With its rectangular shape and unique unloading bays, these cars were an early departure from the "normal" covered hopper designs. From its sturdy design, to the crisp and detailed graphics to attention to even the smallest detail, the Spring Mills PD-3000 is one of the finest models you can find today. ©2014 Ryan C Kunkle, licensed to About.com, Inc.
Over the years, covered hoppers have evolved into very specialized vehicles. To assist in unloading different stubborn commodities, cars have been equipped with a variety of devices. Pressurized cars utilize compressed air to help force the loads out of discharge pipes in the hopper doors. The PD-3000 from North American Car is one of those designs. These smaller capacity cars are usually found in cement, ash, or similarly dense material service. Cars of this design have been around from the 1960s to today. 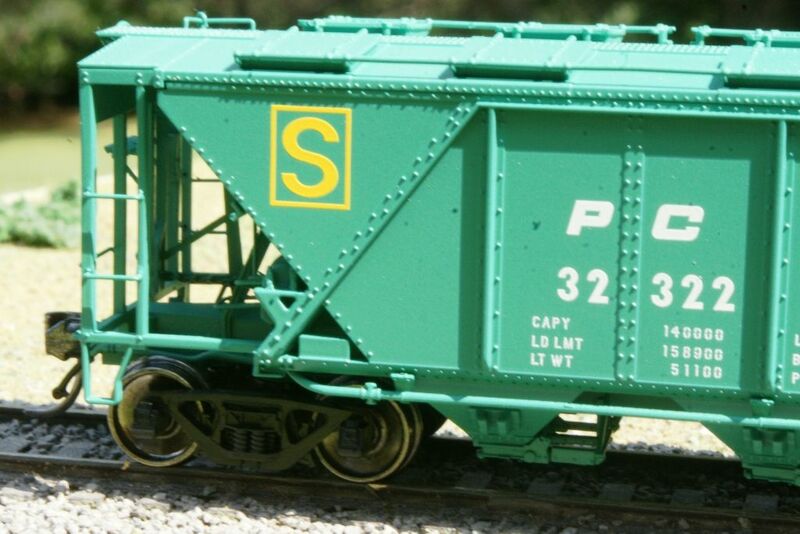 Spring Mills Depot's HO scale models are some of the most accurate covered hopper models available with many details customized by road name and number - right down to the number of weld seems on the body! As common as they are today, no two covered hoppers seem exactly the same. The techniques shown in this simple step by step will help make even an inexpensive model come to life as a unique piece of rolling stock. See how easy it is to capture the look of modern covered hoppers on your layout!